These images, commissioned by Bid Ideas Advertising, were used to show the new/proposed brand ideas of a new Hotel Indigo located on Long Island, NY. 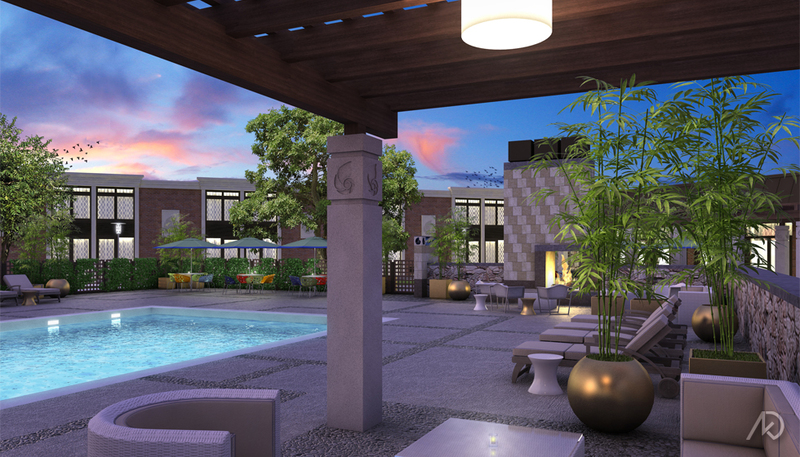 The overall idea, as explained to me, was to incorporate a boutique hotel feel into the hospitality spaces. 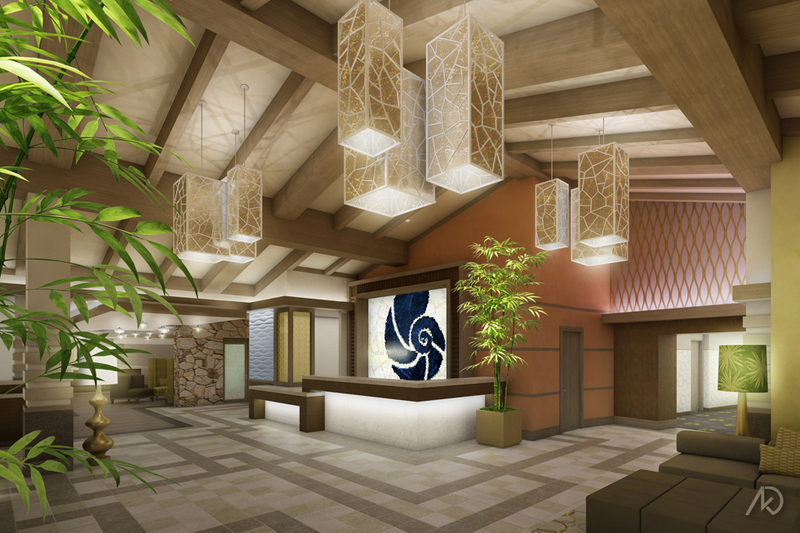 My responsibilities were to visualize the lobby, pool deck, and different options for the banquette hall (not shown). I wanted the exterior to have an overall cool tone with pockets of warmth surrounding the fire pit and the seating under the trellis, while the interior lobby would be an overly warm tone; mostly created by the large incandescent light fixtures. All items in the scene (except for the vegetation) were modeled, textured, and lit by kk. 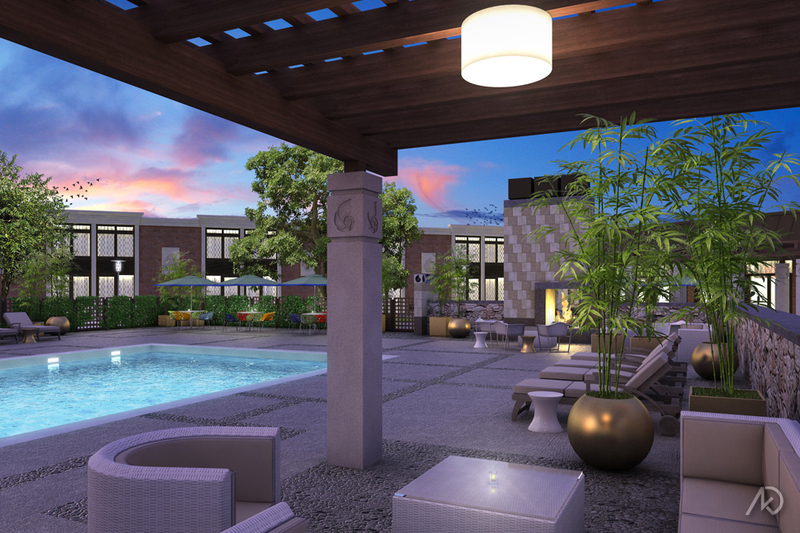 The pool deck image was used to show the intimate exterior spaces surrounding the fire pit and under the trellis. The view is taken from under the trellis looking towards the main hotel structure in the background. The hotel lobby image was used to show the space and its many rich textures. The lobby view gives an overall warm feeling with the emphasis on its earth-toned material pallet. Nine very large light fixtures were used to help add some visual interest in materiality and shade/shadow.